In all the fuss about population aging in the United States, the growing number of young people has often been ignored. Yet the youth population—those under 18 years old—is projected to grow substantially in the coming decades. 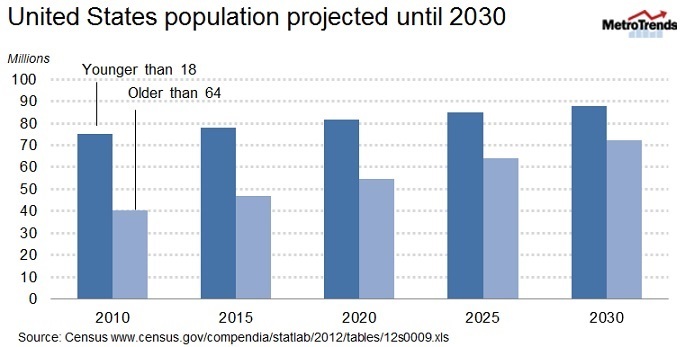 The figure below shows how the U.S. Census Bureau projects the size of the elder population (older than 64) and the youth population through 2030. The elder population is projected to grow more quickly than the youth population before 2030, but is projected to remain smaller than the youth population in 2030. A common way to assess generational balance is to compare the size of the older or younger populations with the size of the working-age population. In 2010, the ratio of youth to working-age adults was almost twice as high as the ratio of seniors to working-age adults (38.2 compared with 20.7). The youth ratio was higher than the elder ratio in all 50 states and the District of Columbia. What this means is—in contrast to many other aging nations, like Japan—the United States has and will continue to have a large pool of adults who can be tapped to ensure the well-being of America’s elderly. This is good news, but it is essential that we invest in those young people. As outlined in Kids’ Share, a review of government spending on children, youth, and the elderly, most of the investments in the well-being of young people come from state and local governments, rather than the federal government. These state and local governments should be anticipating greater demand for investment in youth—a theme that has gotten lost in the intense discussions at the national level about future Social Security and Medicare burdens. Quantity... Not quality. You have a generation detached. You have a generation that has few skills and is unemployed. If you are depending on the government to guide the youth into prosperity, expect disappointment. It does not take a village, it takes 2 responsible parents to set aside their own self centered needs and take care of the "YOUTH" they bring into this world. With a divorce rate over 50% an out of wedlock birth rate @ 60% for females under 25, it's impossible to project anything. The only thing that's certain is, as long as you have an economy in the pits, then older people will work longer and the youth will at a standstill waiting for those jobs to be open. The elderly being taken care of? By who? Out of wedlock mothers? Baby Daddy who is M.I.A.? I think not. The % of accountable people is the only number that holds water.